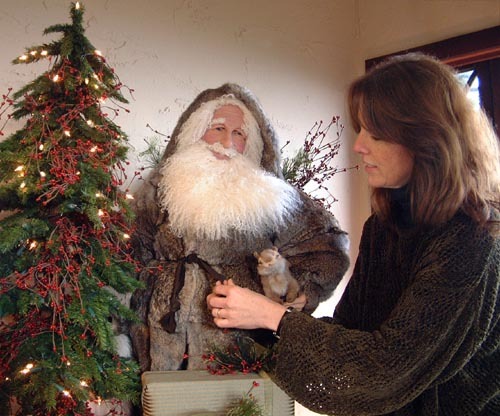 Each Stone Soup Santa is individually designed, hand crafted and decorated inside “Santa’s Workshop” located in our home on Christmas Tree Hill in Northern California. Often asked where she gets all of her amazing designs, Shelie responds that “ideas come from everywhere….old paintings, vintage books, and often a Santa will be ‘imagined’ based on the inspiration of a single ornament, piece of fabric or vintage quilt”. The face and hands are hand sculpted – First, Shelie designs and lovingly sculpts each Santa’s face and hands with polymer clay. She wants every Santa figure to inspire joy, delight and serenity from the viewer. Then, the clay faces and hands are fired at a very low temperature and sanded, painted and glazed. Victorian blue doll eyes are added to make sure Santa’s eyes sparkle with mischief and wonder. To finish, Shelie creates a full head of “hair” and beard from natural Tibetan wool. Underneath the luxurious beard, Shelie hand signs and dates each Santa, so that collectors will know that their Santa is truly one-of-a-kind. Creating the body – The Santa heads are connected to a sturdy body, which Richard crafts from steel and wood, so that each Santa is able to stand on his own without the use of a doll stand. Surrounding the “inner” body is a lovely muslin fabric, with just enough room to make sure that the Santa is stout enough for the years ahead. Santa’s attire – Now commences the finishing work. Shelie creates every Santa’s attire from beautiful velvets, chenille’s or other fine fabrics, both new and vintage. The coats and capes are trimmed in luxurious faux furs, or German and English mohair. To finish things off, a variety of colors of suede are used to handcraft boots, bags and cummerbunds. Lush greenery, berries, stems and garlands are woven through to complete the holiday feel. Finishing touches – Once a Santa is dressed, decorating begins, using a magical combination of new and vintage accouterments, including Christmas ornaments from all over the world. Many of our Santas have handcrafted and very realistic animals joining them as members of their delightful entourage. Vintage and new mohair bears (including many from Steiff, a German-based plush toy company) are used to create the vision of stepping back in time. Many of our Santas carry leather and suede bags, stuffed to the brim with elegant velvet and fabric-wrapped packages, finished with beautiful silk and organza ribbons. Most of our Santas have more than one hundred hand stitches in this final phase of bringing each design to “life”. Beautiful from every angle – One critical element for Shelie and Richard has always been that every Santa must be designed to stand alone and be able to be placed anywhere in the room…..so that no matter where you are standing, if you blink, he might just turn around and smile at you.